You can play Kenken online here - options include the puzzle size, operations to use, and difficulty level. 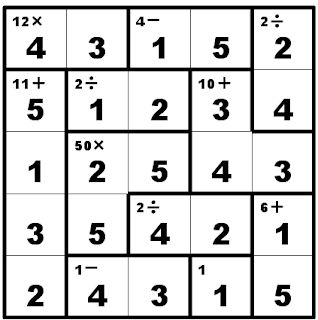 The image above shows a 5x5 solved Kenken puzzle that uses all four operations. You might also check the offer for free weekly KenKen puzzles that Denise mentions. It starts out with simple addition but advances in levels. Soon, you will see tiles with "-1", "-2", etc. which indicate subtraction. And after a few more levels you'll see *2 and similar, indicating multiplication. Did you know that Khan Academy not only has videos, but they have added (in recent years) a TON of free interactive practice exercises? These exercises are of good quality, and also include word problems, graphing, and other problems with visual models. And they span all areas of elementary, middle, and high school math. The search for a math topic will list a lot of videos and exercises intermixed. It will help if you include the word "practice" in your search. Get 30% off of all of Math Mammoth BLUE and LIGHT BLUE series downloads & CDs at EDUCENTS. The offer is valid till August 25, 2016.